Modern Apprenticeships help you build the experience and skills that employers want to see. No matter what stage you’re at, they’ll help you get set for a bright future. And now, there are more ways than ever to get involved. 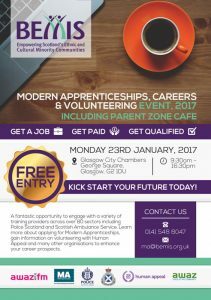 Meet and connect with prospective Employers at our Careers & Modern Apprenticeships Event. The event has been designed to encourage young people and their families to gain stronger insight and connections within the MA family, ensuring Scotland’s economic future. Our events are all about building knowledge, confidence and connections for ethnic and cultural communities to enable them to be active citizens and gain access to meaningful opportunities. Employment is key in ensuring that all young people and communities thrive.